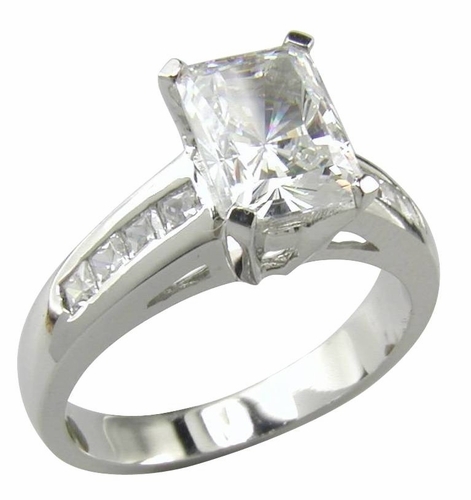 This is a classic Radiant Emerald Cut Channel Set Princess Cut Cubic Zirconia Solitaire Engagement Ring. It features a 1.5 carat 8x6mm radiant emerald cut diamond look cubic zirconia center stone with a single row of princess cuts that are channel set down each side of the shank. This radiant emerald cut solitaire makes for a great engagement style ring and can be worn with a band of your choice. 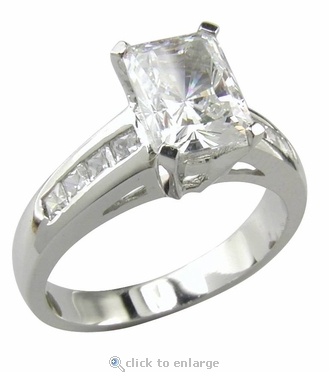 The center stone is held in place with an integrated head of four prongs. A total carat weight of 2.5 carats of the finest cubic zirconia diamond simulants is set in this solitaire. You can order this solitaire ring at this amazing clearance price in 14k yellow gold or 14k white gold. You can also have this ring made in 18k gold or luxurious Platinum via special order. Clearance items may be sized for an additional fee of $35. Please see menu options below for sizing. Sizing below a 5 or above an 8 is subject to additional fees. Please call for a quote.